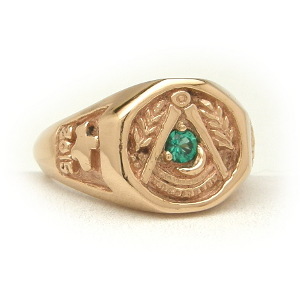 This is our version of a District Deputy Grand Master's Ring. It's sort of a limited, made to order project, please contact us at studio@mastersjewel.com to enquire about this special edition ring. One side has the 47th problem of Euclid surrounded by a cable tow, while the other side has the state and year of the DDGM's service. 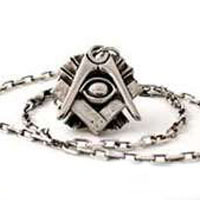 The crest has a Square, Past Master's quadrant, Acacia flourishes and a Crescent Moon which is acting as one of the gemstone prongs. There is a considerable amount of custom work to put the state and year on the side therefore this ring is a quoted price.